One of the newest and up and coming popular wedding venues in the GTA is one that is north of the city near the town of Orangeville. Cambium Farms is a converted barn and farm property made into a unique event venue. There is a growing trend among young people of fusing the old world of farming, the vintage glamour of the 1920s and the modern feel of a wedding gala and Cambium Farms is a perfect place for that. With it's natural ceremony location amongst the trees and fields one feels like they are all by themselves in nature as the bride and groom get married under God. Journey from there into the beautifully restored and modernized barn complex capable of hosting 250 guests with fantastic catering and all of the garter tossing and bouquet toss excitement you can handle under led DJ lights on the dance floor. The first dance can be enjoyed in amongst the old wooden beams of the barn. 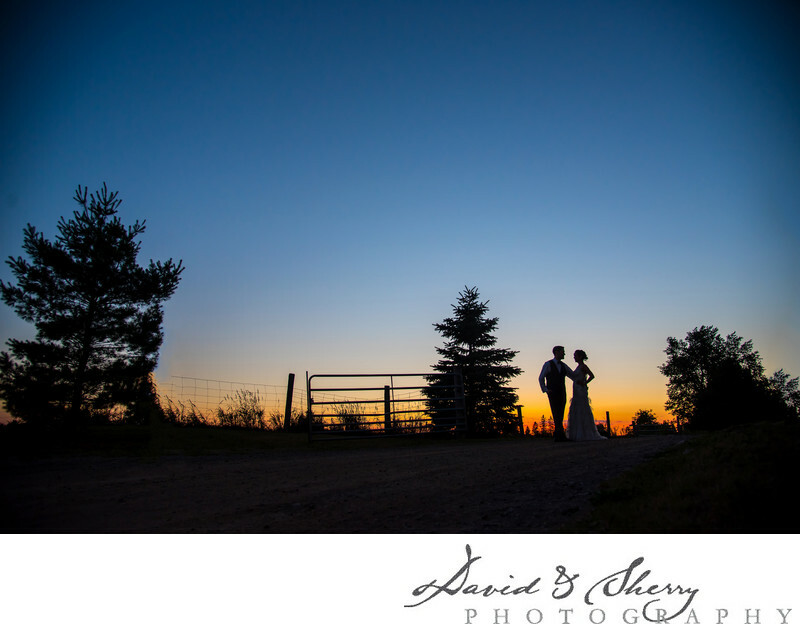 The photos from these weddings throughout the property and at sunset are beautiful. Here the bride and groom are silhouetted against a stunning sky with blues and oranges as they take a few moments out from their reception to take some pictures while the sun sets. We love these wedding photos at Cambium Farms due to their creativity and artistic feel.